New figures show the water watchdog received 766 complaints during the first quarter of 2018/19 – a 21 per cent reduction on the 968 received during the final three months of 2017/18. 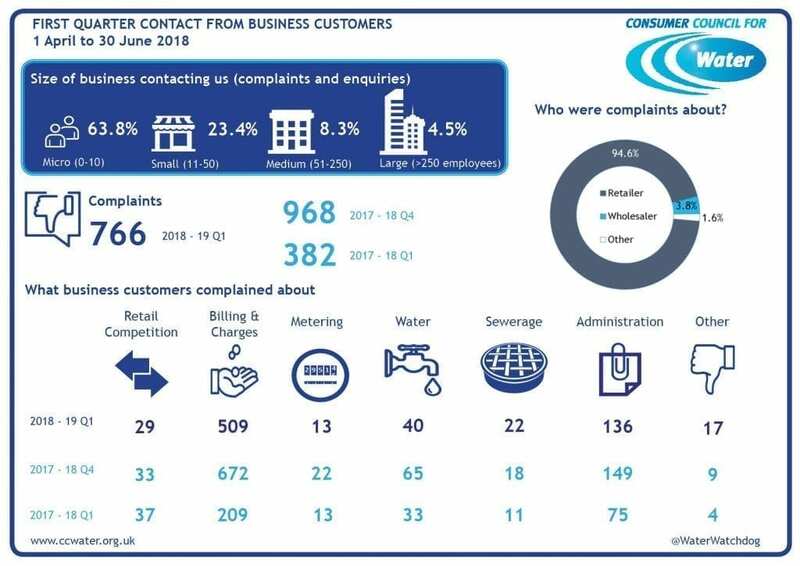 It is the first time CCWater has seen non-household complaints fall during a full quarter since the market launched on 1 April 2017. However, complaints are still double what they were during the first three months of the market, and CCWater has warned some retailers have much more to do. CCWater policy manager Evan Joanette said: “It’s too early to say whether the poor performing retailers on complaints have turned a corner, but we’re encouraged to see this improvement which is long overdue. CCWater said it wants to see retailers providing more support and information to micro and small businesses who accounted for nine out of ten non-household contacts to the watchdog. Meanwhile, on the domestic side, Southern Water, Bristol Water and SES Water were all warned to improve their customer service and will be required by CCWater to show what action they are taking to reduce complaints. A report published by CCWater in September revealed that households made more than 2.1 million calls to resolve problems last year.